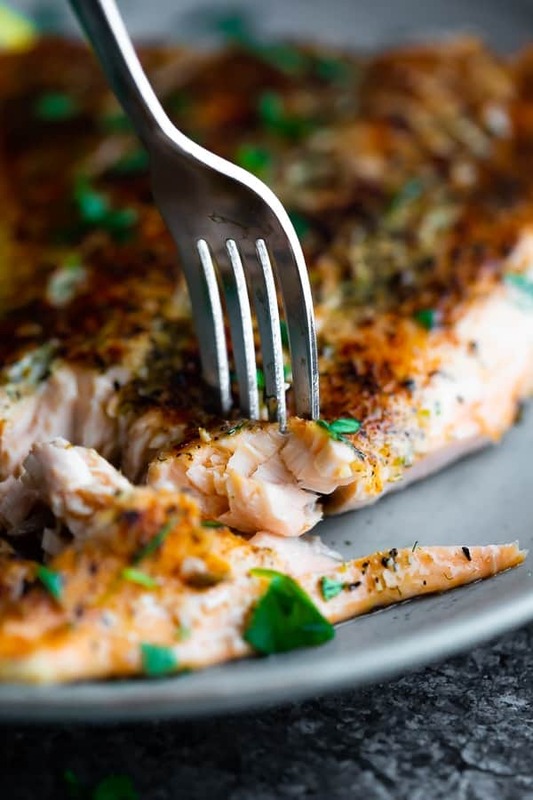 How to cook salmon- showing you two EASY ways to get perfect, tender salmon every time! No more dry, overcooked salmon! It’s How to Monday and today we’re talking salmon! 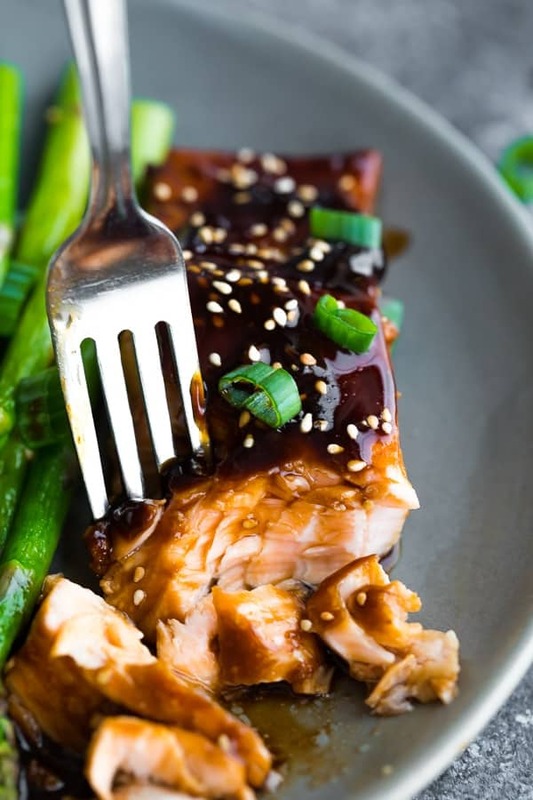 Salmon is one of our favorite proteins to cook with and I try to use it 1-2 times a week. The problem with salmon? It is SO easy to overcook. And when it is overcooked, salmon is dry, tough, and just plain bad. Today I’m sharing with you how to cook salmon in the oven and how to cook salmon on the stove! These are my two favorite methods by far, although we also love grilling it. I plan on updating this post with grilling directions when it warms up a bit! This post covers a lot! When it comes to cooking salmon in the oven, you are going to find SO MANY DIFFERENT TEMPERATURES recommended. Seriously, google it! Some people swear by 350°F, some people swear by 450°F. Me? I’m in the high temperature camp! I’ve adapted my cooking method from Cook’s Illustrated and it works like a charm! Pre-heat oven to 450°F with your baking sheet in the oven <–this is the key step! Get your baking sheet nice and hot! Brush (all sides of the) salmon with oil, and season with salt & pepper, or one of these 7 Spice Blends. Once the oven is at temperature, carefully remove the pan and transfer salmon to the hot pan skin side down. Place salmon in the oven and reduce the temperature to 250°F. Cook for 12 minutes (for 5-6 oz fillets; pictured above). This method really helps seal in the juices by exposing the salmon to high heat right off the bat. It really does produce the JUICIEST salmon! This is my FAVORITE way to cook the thinner tail portions of salmon. I find roasting them in the oven is too finicky and because they are so thin, they are more prone to over-cooking. Season salmon with salt & pepper or one of these 7 Spice Blends. Place salmon in the pan skin side down and cook for 3 minutes. Carefully flip and cook for another 2-4 minutes, until fish is cooked through and flakes with a fork. Cook time will depend on the size of your fillet. Smaller portions will be done close to 2 minutes, whereas the larger one pictured above took closer to 4 minutes. 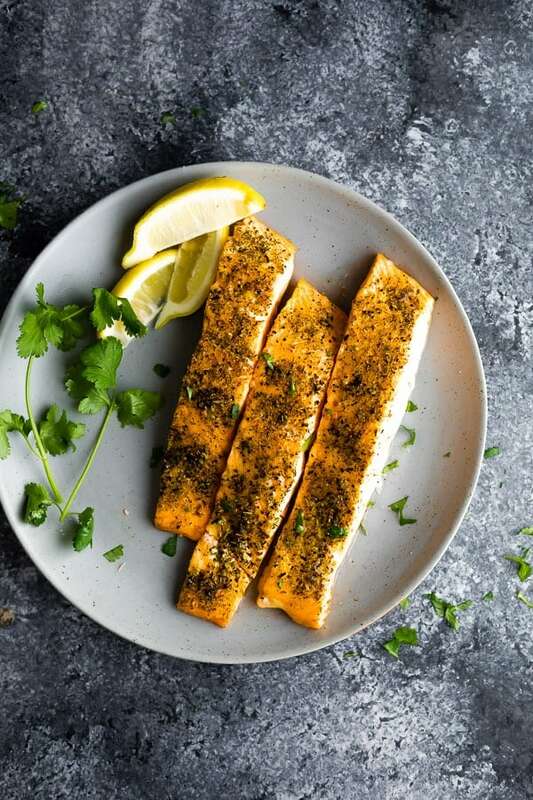 To prevent salmon from overcooking, it’s important to set a timer and check on your salmon before your recipe says it will be ready. All ovens and pans cook differently and you do not want to overcook it! Use a fork- gently flake the middle portion of the salmon with a fork. If it flakes away easily, it is ready to come out. If it is wet and doesn’t want to flake, it is not ready. Use a thermometer- the internal temperature of the salmon (at the thickest part) should say 145°F. When in doubt, err on the side of underdone. Your salmon will continue to cook after removed from the heat for a few minutes. Fresh salmon needs to be used within 4-5 days, so we often buy a whole salmon side, cut it into portions, and freeze. Cut salmon into 5 oz portions (for the thicker part), or larger 15-20 oz portions (for the thin tail sections). ). Squeeze out as much air as possible and make sure you include the date on the bag. Freeze for up to 2 months. I prefer to eat within 2 months because I find the longer salmon is stored in the freezer, the more the quality declines. 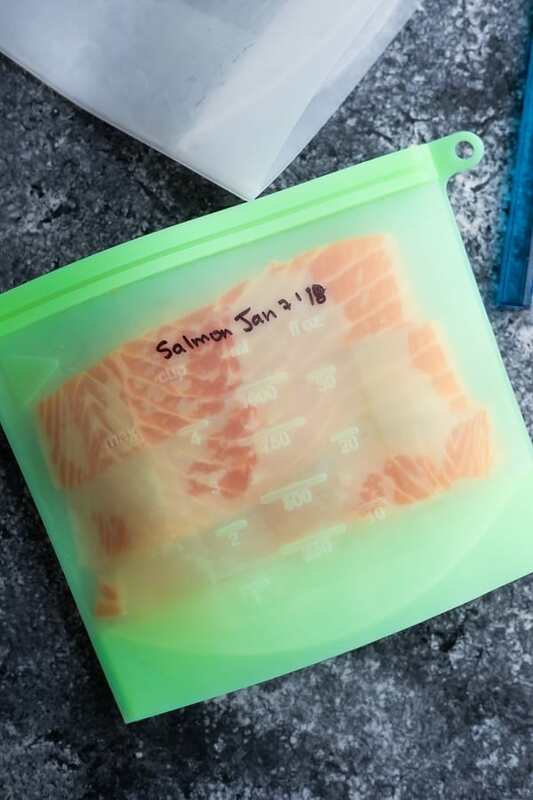 *however salmon stored in foodsaver bags lasts forever…a year or more! Thaw overnight in the fridge, or at room temperature for 2-4 or hours before cooking. **due to the thickness of silicone bags, they take longer to defrost than plastic bags. Salmon MUST be completely thawed before cooking, otherwise the outside will end up dry and the inside will end up raw. How long are we cooking salmon in the oven? This depends completely on the size and thickness of your salmon fillets. 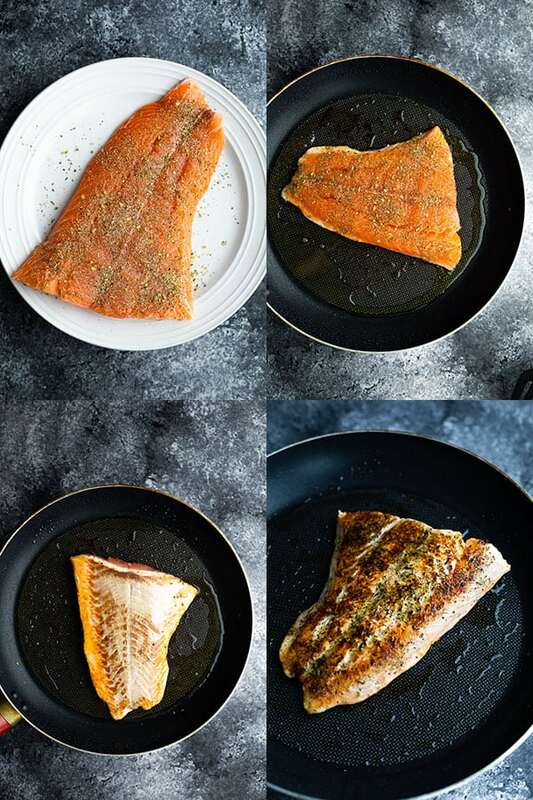 For the 6 oz salmon fillets pictured (about 2 inches thick in the middle), I like cooking salmon in the oven for 12 minutes exactly using the 450°F/reduce temp when salmon goes in method. For smaller fillets, 4-5 oz, I’d start checking at 8 minutes. Err on the side of underdone because the salmon will keep cooking for a few minutes after removing from the oven. 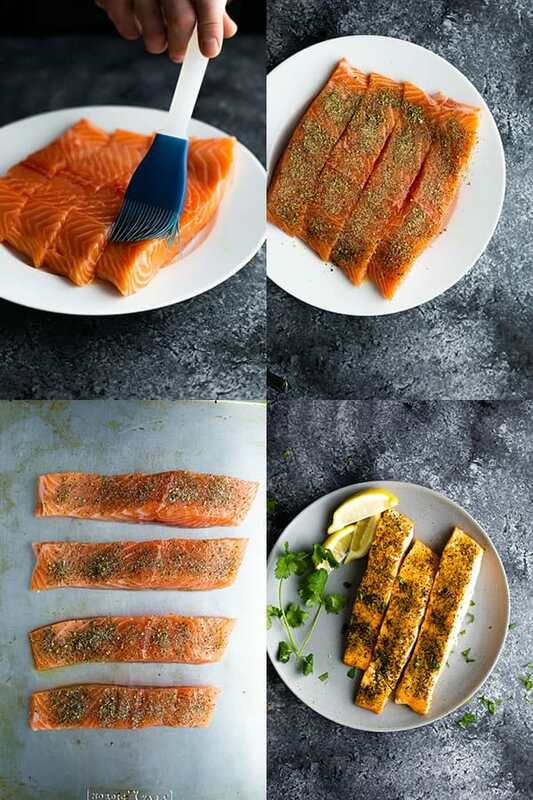 What side do you cook salmon on first? If your salmon has skin, always place it skin side down (for both the pan and oven methods). 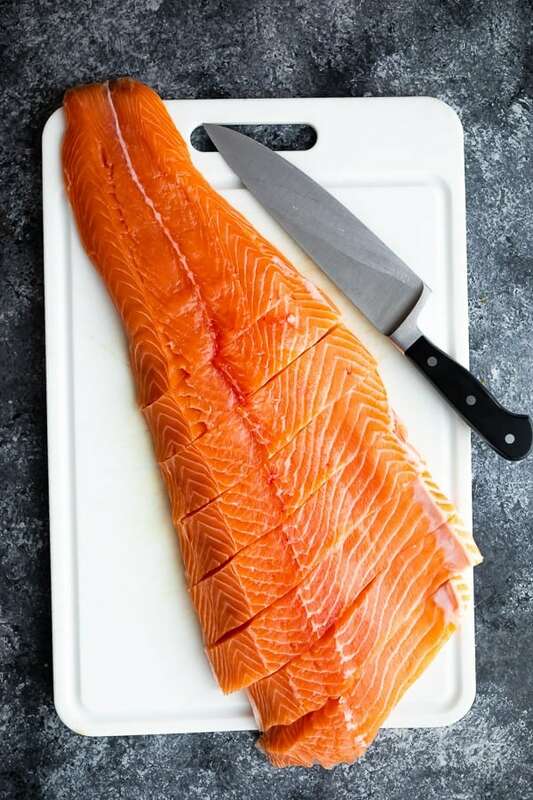 Make sure you brush the skin with oil to help it release when you need to flip or remove salmon from the baking sheet. What temperature do you cook salmon to? If you are using an internal thermometer, your salmon is done when it reaches 145°F. Can you cook salmon from frozen? I don’t recommend it as it will cook unevenly and risks overcooking/drying out. What is the white stuff that comes out of my salmon? It is albumin, a totally harmless substance that can make your salmon look kind of unappetizing. You can leave it there or scrape it off, totally your choice! You can read more about it here. 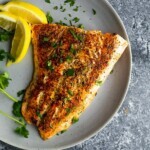 How can I give my salmon more flavor? 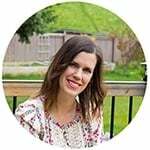 As a salmon-addict, I have a whole lotta ideas for you! What can I serve my salmon with? Heat oven to 450°F. Place a sheet pan or baking dish in the oven to heat up. 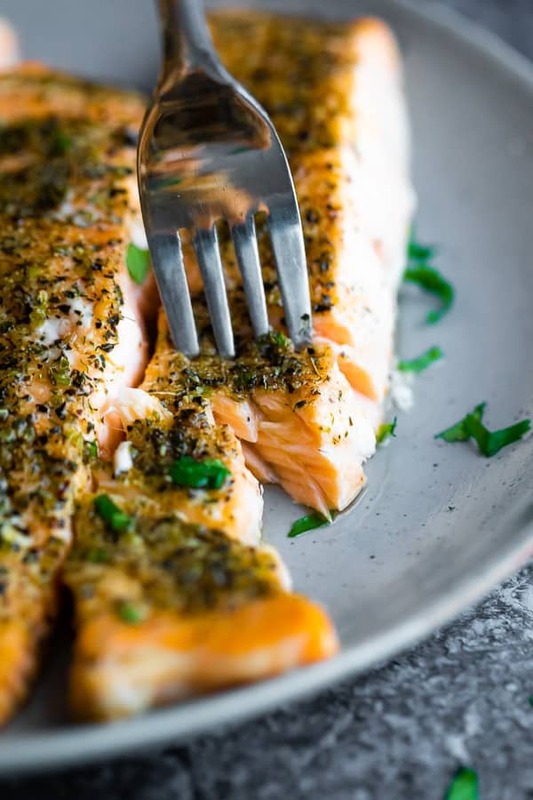 Brush salmon fillets with olive oil on both sides. Season generously with salt & pepper or a seasoning blend. Once oven (and pan) are pre-heated, carefully remove the pan from the oven. Brush the pan with olive oil and place the salmon skin side down on the pan. Quickly return to the oven and reduce oven temperature to 250°F. Bake the salmon until it is cooked through to an internal temperature of 145°F or it flakes with a fork. Err on the side of slightly undercooked as the fish will continue to cook after removed from the oven. For 6 oz fillets, 12 minutes works well. Allow fish to cool for 3-5 minutes, then serve with a squeeze of lemon. Heat 1 tablespoon of olive oil in a nonstick pan over medium heat. Brush salmon with more olive oil and season generously with salt & pepper or a seasoning blend. Place salmon skin side down in the skillet and cook for 3 minutes. Carefully flip the salmon and cook for another 2-4 minutes. For smaller portions, 2 minutes may suffice, whereas larger portions (like the one pictured in this post), 4 minutes may be necessary. Fish is ready when it flakes with a fork or reaches an internal temperature of 145°F. 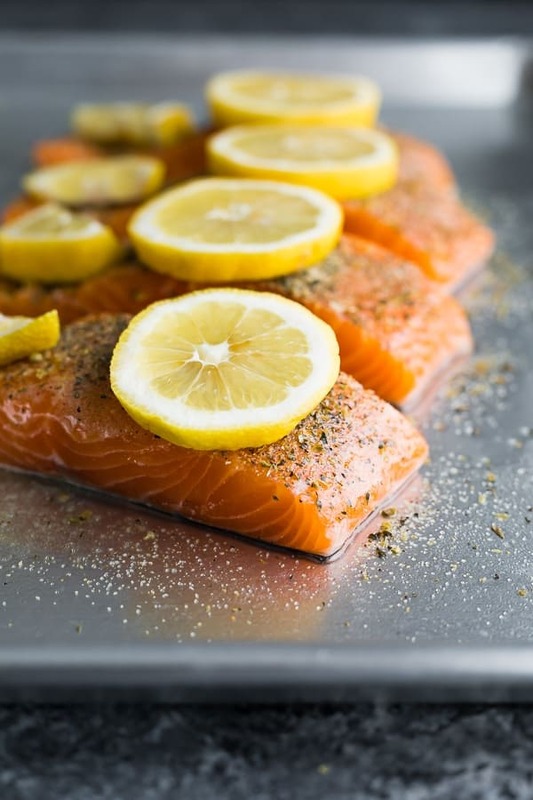 Remove from heat and allow salmon to cool for 3-5 minutes, then serve with a squeeze of lemon.